Lush greenery, rich history, delicious cuisine, exotic spices – Kerala is God’s own country in every sense. Being one of the first points of entry for the British and Portuguese, the city of Cochin to this date remains a popular trade centre and tourist attraction. Apart from the monuments and all that history, the capital city Trivandrum and Kakkanad are popular IT hubs that employ lakhs of people. Real estate has always been a strong market in Kerala where everyone is keen about adding as many homes to their names as possible. With the IT sector booming in the state, the demand for rental has only skyrocketed. For those of you wanting to know about creating rental agreements in Kerala, this article is a must read. For many years, the job of creating the rental agreement was outsourced to lawyers. Tenants and landlords simply put forth their clauses to the lawyer who in turn handles the stamp paper and registration requirements. While this method is still favoured by many, fact is that people of today have no time to prepare an agreement this way. It is also complicated by the fact that the lawyer is going to charge a fee that he/she sees fit. 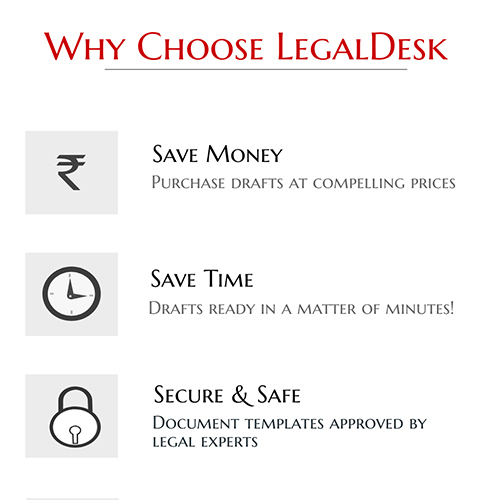 For those of you who wish to do all of this themselves, LegalDesk has pre-drafted, ready to use, lawyer verified rental agreements and a host of other legal documents. These documents will save you time and a lot of money. Tax levied on any document for making it legally valid is called Stamp Duty. In Kerala, the Stamp Duty for leases is charged at 7.5% of the rent amount although people generally stick to INR 100 Stamp paper commonly. Even though e-Stamping was announced in Kerala, it is still not very prevalent. People still use the traditional Stamp paper for all intents and purposes. They are widely available with many stamp vendors throughout main cities. Registering a document is a way of deterring potential frauds and forgeries. It also stands as proof that the people mentioned in the document are the ones who indeed signed the document. And most importantly, all details regarding the property in the document is revealed if a document is registered. Feuds, cases and past titles of the property become a matter of public record when a rental agreement is registered. Registration charges for leases in the state of Kerala are charged at 2% of the rent amount. Commercial Leases: Such leases are signed for business/ commercial purposes alone and is mostly among business or a business and an individual. Such leases rarely have a standard format as the agreement must adapt to the needs of the particular business being considered for lease. Large sums of money are involved and is rarely signed for short periods of time. Registration and proper Stamp Duty are rarely overlooked. Long Term Lease: These are typically for residential purposes with the term of the lease spanning years. Such leases rarely involve monthly rent payments as a huge lump sum is often paid in advance. Registration and proper Stamp Duty are rarely skipped for such leases. 11-Month Rental Agreement: This is the most commonly used agreement format throughout the country. The term of this lease is 11 months at the end of which both parties have the freedom to renew/ terminate the contract. Registration is skipped as the term is less than a year and such leases will require the tenant to pay a fixed monthly rent to the landlord. Monthly rent, security deposit & maintenance charges: Amount to be paid as rent, security deposit and maintenance charges (if any) must be clearly mentioned in the contract to avoid conflicts. The frequency of payments too must be mentioned. Lock-in period: Minimum duration during which neither party cannot terminate the rental agreement is called the Lock-in period. This is to ensure that neither the tenant nor the landlord backs out out soon after the move is made and thereby incur losses to the other party. Duration of lock-in period must be specified in the rental agreement. Pets: Some landlords dislike the very idea of having animals inside their property. If the landlord in questions entertains such a view, he/she is expected to put that down in the contract. Overstay: If the tenant continues to occupy the premises even after the term of the lease is up, the Landlord may charge a penalty, the value for which was agreed upon in writing. Consequences of late payment: If the tenant fails to pay rent before the agreed date, the penalty for the same must be clearly mentioned in the contract. Food habits: If the landlord is particular about the nature of food being consumed in his property or is against the idea of alcohol/ substance abuse within his property, he/she shall mention it in the contract. Owner’s authenticity: Always ask for documents that can prove that the guy posing as the landlord is indeed the landlord. Payment receipts: Insist on getting back receipts for every payment you make. Be it rent, maintenance, security deposit or even the token advance. Deductions from security deposit: When the tenant vacates, the landlord is expected to return the security deposit to the tenant after making necessary deductions. It is the tenant’s job to ask for a detailed description about how much was deducted for what. Agreement registration: If your rental agreement is not registered and a legal battle ensues, the court shall never consider your rental agreement as primary evidence. An unregistered contract is only seen as collateral evidence. This is a certain amount of money collected by the landlord from the tenant as a precautionary measure. If the tenant fails to pay rent or causes damages to the premises, the compensation for it shall be collected from the security deposit. In Kerala, 2-3 months worth of rent is usually collected from the tenant. This amount is refundable after valid deductions. A small amount of money collected towards blocking the property for a potential tenant is called the token advance. This amount is non-refundable and if either party backs out after this payment is made, that party is responsible for compensating the losses incurred by the other party. Once the token advance is paid, the landlord is expected to prevent other potential tenants from developing an interest in the property by taking it off the market.